We’d love your help. Let us know what’s wrong with this preview of Conquest by Hugh Thomas. Ringing with the fury of two great empires locked in an epic battle, Conquest captures in extraordinary detail the Mexican and Spanish civilizations and offers unpreced Drawing on newly discovered sources and writing with brilliance, drama, and profound historical insight, Hugh Thomas presents an engrossing narrative of one of the most significant events of Western history. To ask other readers questions about Conquest, please sign up. This is one of those books I'd seen on the shelves of my library and bookstore for years. The thickness of the book was the most intimidating factor which prevented me from ever picking it up. Its really silly to admit this, but the girth and title of the book reminded me of those dull volumns proped up in a dusty scholar's office. The kind of book you pick up to enduce yawning. Nothing could be further from the truth. I lost count of the nights I lost sleep because I could not put the book down t This is one of those books I'd seen on the shelves of my library and bookstore for years. The thickness of the book was the most intimidating factor which prevented me from ever picking it up. Its really silly to admit this, but the girth and title of the book reminded me of those dull volumns proped up in a dusty scholar's office. Nothing could be further from the truth. I lost count of the nights I lost sleep because I could not put the book down to get a good night's rest. I had just seen Michael Woods' documentary on the conquest of Mexico and I was anxious to learn more. I picked up Hugh Thomas' book and told myself I would put it back if the first page didnt engage me. Needless to say I was hooked from the first paragraph. Hugh Thomas has done an amazing job, showing us an almost day by day account of Cortes's conquest of Mexico. He provides an incredible amount of background knowledge of both Ancient Mexico and the social, political sitiuation in Spain. The result is a wonderful portrait of the two main characters as their world's are about to collide. Montezuma is the scholarly Emperor, unsure of himself as he begins to hear rumors of bearded strangers making their way along the Eastern seas. This man clearly has the best interests of his people in mind, but in the end; his melancholy nature and his inability to inspire his people, will lead to the ultimate disaster for his entire civilization. Cortes the the ultimate "wanna be"; born on the lower tiers of Spanish nobility, he is hungry to improve himself. Consequently he is quick to make decisions and exploit the weaknesses of others. With only a few hundred soldiers, he managed to recognize that not all is well with the Aztec Empire. He is quickly able to gather native allies and convince them to join him in to overthrow the Aztec masters. I was constantly surprised at how adaptable Cortes would become. After his most discouraging set back, in which his treasure and more that half his men are captured or killed; he had the audacity to gather more allies and supplies to mount yet another campaign for the ultimate prize. The third character to emerge from these pages is Tenochtitlan itself. Hugh Thomas presents the Aztec capital as a truly wonderful place. He introduces the metropolis neighborhood by neighborhood, palace by palace and street by street, canal by canal. During the Spanish siege and in the heavy street fighting we get a sense of how this city of 300,000 people is slowly dying. Cortes wanted to present this city as the jewel in the crown to Emperor Charles V, but even he and his men weep when they see what has happened to the city set in the middle of a lake, like another version of Venice. I found the book incredibly rich in detail, to the point we even get to know the name of Cortes' dogs and horses. This is a solid, well-documented and researched book about a topic that is intriguing and something I had always been interested in reading. The writing is a little 'old' and the english grammar can throw you off if you aren't used to it. I loved the clarity of the history and the way the author goes through the motion to explain what happened, how it happened and as many motives as possible behind the decisions of the Spanish and the Mexica. Anyone interested in the discovery of new civilizatio This is a solid, well-documented and researched book about a topic that is intriguing and something I had always been interested in reading. The writing is a little 'old' and the english grammar can throw you off if you aren't used to it. I loved the clarity of the history and the way the author goes through the motion to explain what happened, how it happened and as many motives as possible behind the decisions of the Spanish and the Mexica. From watching The Hunt for Red October I knew that Cortez burned his ships when he got to the new world. And since they speak Spanish in Mexico, I figured the Spanish won out in the end. But I was a little short on the details. I read this book to try and learn what happened. And I did! As far as narrative histories goes, this one is pretty impressive. The first 100 pages or so introduce the Aztec and Spanish civilizations as the existed before they discovered one another. And then it's off to th From watching The Hunt for Red October I knew that Cortez burned his ships when he got to the new world. And since they speak Spanish in Mexico, I figured the Spanish won out in the end. But I was a little short on the details. I read this book to try and learn what happened. And I did! As far as narrative histories goes, this one is pretty impressive. The first 100 pages or so introduce the Aztec and Spanish civilizations as the existed before they discovered one another. And then it's off to the conquesting, as Cortez reaches Mexico and sets about toppling the Aztec empire. The really interesting part of the book is learning how heavily Cortez relied on the Aztecs enemies in his efforts. I suppose it was all over for pre-contact Mexican civilizations once smallpox shows up, but it's interesting to wonder what would have happened had the various groups of Indians not been so focused on short term gain. Exceptional. Easily one of the greatest accounts of the conquest of old Mexico ever written. Not only are there newly discovered sources shining an unexpected light on centuries-old accounts, not only does the author display a finely tuned sensitivity towards both the bias of past historians and the massive cultural gulf between the Mexica and the Castilians, but the author is also a damn fine writer. This book is a riveting tale, a page-turner. Hugh Thomas has done humanity a great justice here Exceptional. Easily one of the greatest accounts of the conquest of old Mexico ever written. Not only are there newly discovered sources shining an unexpected light on centuries-old accounts, not only does the author display a finely tuned sensitivity towards both the bias of past historians and the massive cultural gulf between the Mexica and the Castilians, but the author is also a damn fine writer. This book is a riveting tale, a page-turner. Hugh Thomas has done humanity a great justice here. This book is about an INSANE, mind-boggling, unforgettable, dumbfounding, bizarre, heartbreaking event that will electrify you. You won't be able to put it down. It is difficult to comprehend that these events happened, that these people existed...that these two empires at their zenith hurled themselves into an alien void. Witness the birth of the West. 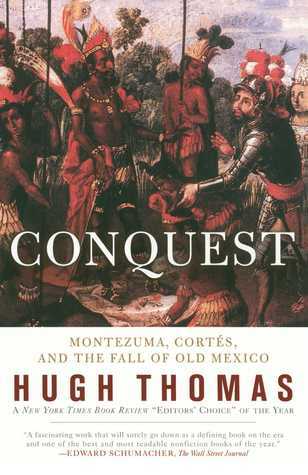 Hugh Thomas captures the riveting story of Cortes and Montezuma, the fall of the Mexica, and the birth of a new nation, with elegant prose and fine historical judgment. This was my second reading of this book, a minor masterpiece ... sorry to hear that Mr. Thomas, a life peer in Lords and former Thatcher advisor, recently passed. I am encouraged to look at the rest of his works. This book asks a lot of you in terms of endurance but delivers a fascinating, well researched narrative that never fails to remind you of its global significance. Fascinating, if overly wordy account of Hernan Cortes' 'conquest' of Tenochtitlan and the empire of the Mexica. I love this kind of stuff. I took a class on Pre-Columbian Mesoamerican cultures in college... for fun. The idea of entering a strange land full of strange plants and animals and people and customs fascinates me. Unfortunately the conquistadors in this story weren't so much interested in documentation and anthropology as they were in collecting as much loot as possible (and converting Fascinating, if overly wordy account of Hernan Cortes' 'conquest' of Tenochtitlan and the empire of the Mexica. I love this kind of stuff. I took a class on Pre-Columbian Mesoamerican cultures in college... for fun. The idea of entering a strange land full of strange plants and animals and people and customs fascinates me. Unfortunately the conquistadors in this story weren't so much interested in documentation and anthropology as they were in collecting as much loot as possible (and converting everyone to Catholicism). The main problem I had with this work was that there was almost too much detail. It becomes name soup and that's mostly on the Spanish/Castilian side. There were so many names being thrown at me, and not just the names of the specific player, but where he was from and who he was related to. It's great that so much historical detail has survived (about which soldiers accompanied whom to where), but it really was a bit much now and then considering these people are little more than names at such a far removed time in history. I think because we know so little about the Mexica side, the name soup here wasn't as prevalent, even if their names were quite the mouthfuls. Another major problem I had was with maps. It would have been helpful if the maps of places (the valley of Mexico, including the cities; Cortes' overland trek to Tenochtitlan; the lake, showing the surrounding towns and causeways; etc.) were placed in some more easily accessible spot (ie, the front of the book). That way when another town name or causeway was being thrown at me, I didn't have to struggle to locate in some previous chapter the map showing this location in relation to others. I think it went the other way too (locations were mentioned with a map not appearing showing it until later). I could almost swear there was no map of Spain showing all the places mentioned (and many were mentioned). That would have been extremely helpful for someone pretty unfamiliar with the specific geography of the Iberian peninsula, though not necessary to the main story. But I'm a map fiend; I could stare at those kind of things, gleaning relationships, all day. The writing was a bit dry, which I assume is a byproduct of the story taking place nearly 500 years ago. Events come off as far-removed historical happenings, not real things happening to real people. The author does the best he can in providing numbers for these things (in regards to troop strength, deaths, etc.) but the numbers vary wildly due to the participants' exaggerations. The grammar and comma use is also a bit wonky at times. Despite the author's name, I began to wonder if this book had been translated from Spanish to English. Overall a fair and balanced view of both sides, showing both the awful and the good. I had either forgotten (college was, alas, not so recent a time) or never knew that the Mexica practiced so much cannibalism. Makes sense considering the lack of meat sources (??). This is just one of those tragic historical events that are rife with 'what ifs?' What if Montezuma had decided to wipe out the Castilians? What if the Mexica gave up on trying to capture their enemies for sacrifice and fought to kill instead? What if Cortes had not left the city to head off a rival on the coast (thereby leaving the city in the hands of Alvarado, who went and massacred a bunch of people at a festival)? Would Tenochtitlan and the lake still be around today? Conquest is a gigantic book about Montezuma, Cortes and the fall of old Mexico, as it states in the title. This book is huge and detailed; it's over 1000 pages long with tiny writing, and the footnotes/appendix make up another couple hundred pages, and then there's references, tables, diagrams, etc. In terms of world history, the grand tale of Cortes is probably my favourite. The mischief, the swashbuckling adventures, the clash of these civilisations, these two men are incredible heroes; men of Conquest is a gigantic book about Montezuma, Cortes and the fall of old Mexico, as it states in the title. This book is huge and detailed; it's over 1000 pages long with tiny writing, and the footnotes/appendix make up another couple hundred pages, and then there's references, tables, diagrams, etc. In terms of world history, the grand tale of Cortes is probably my favourite. The mischief, the swashbuckling adventures, the clash of these civilisations, these two men are incredible heroes; men of such bravery and intellect don't exist any more in our modern world. So, the underlying story is good, in fact it's one of the greatest true tales of all human history. But what of *this* book, and *this* storyteller? Well, this book is excellent, but not for the right reasons. As I've stated, it's detailed and huge, heavier than a phonebook, and reads a bit like one. It and has around 300 main characters and no detail is spared. This isn't really a page-turner, it's more like a reference book. If you want to know what Cortes wrote in his journal on a certain date, or how many sacks of grain Montezuma delivered to someone, or an intricate description of the provinces and culture and architecture of the various hundreds of different villages, then this would be an excellent reference book for a scholar or historian. But it's not light reading. In fact, as much as I am obsessed with this story, I found much of the book to be a painful slog. It's not an action-packed narrative, it's more like reading a 1000 page wikipedia page, complete with references, quotes and without any embellishment or spice. It's excellent because this book is the definitive history, but the author has favoured detail and accuracy over storytelling. In conclusion, if you're a student studying history and you need a reference book on this topic, or if you're just obsessed with this topic (like I am), you've already read several books about it and you want to know more details, sure, grab this book. Este libro de casi 900 páginas es uno de esos que lees a lo largo de la vida y no se te olvida nunca la experiencia. La forma de contar esta aventura, si se puede definir todo lo que ocurre aquí en una palabra, es insuperable. Permanecemos a lo largo de todo el libro muy, muy cerca de Cortés, el alma y el corazón de toda la empresa; le seguimos los movimientos y hasta los pensamientos, las motivaciones, las vacilaciones. El autor no pierde el tiempo con teorías ni valoraciones históricas de ningún tipo: es mucho lo que hay que contar, de por sí ya es casi increíble, y no se necesita teorizar ni adornar en lo más mínimo este relato que es de cabo a rabo la aventura más apasionante que ha protagonizado ser humano alguno en lo que va de historia del mundo. Lo que sí es aconsejable, como aperitivo, es leerse antes el relato en primera persona de Bernal Díaz del Castillo, en la edición de Planeta, en bolsillo, de caso mil páginas. Igual de apasionante, pero desde el punto de vista del soldado raso, acompañando al héroe Cortés muy de cerca, recibiendo órdenes y bregando en la lucha diaria, pero que estaba, como es obvio, a verlas venir. Luego leer el libro de Hugh Thomas y contemplar todo el paisaje histórico, todo lo que había detrás de la conquista guerrera: desde el punto de vista de los mexicanos y de los españoles. Semejante empresa daría a un mediocre historiador muchas oportunidades de dejar opiniones o teorías, de apuntar datos estadísticos o de otro tipo, de interés colateral al tema en cuestión. Hugh Thomas, no. Este autor acertadamente se da cuenta de la envergadura de lo que tiene entre manos, y de la relevancia histórica que tiene, pues significa ni más ni menos que apenas unos cientos de hombres y unos caballos se adentran procedentes de un continente remoto en un continente desconocido donde los jefes ejercen una tiranía totalitaria con métodos más bárbaros que los nazis, y cuyo deporte mayoritario y obsesivo son los sacrificios humanos. Sacrificios que se cuentan por millones: pueblos, naciones enteras que son vencidas, sometidas, y sus incivilizaciones destruidas. ¿Qué hizo posible la conquista de Cortés? La determinación, astucia y valor de un hombre. Y la suerte de hallarse a muchos pueblos que antes preferían apoyar a Cortés que seguir siendo los esclavos y víctimas de los aztecas. Cortés fue una bendición comparado con lo que tenían aquellas gentes. The Conquest of Mexico was a historical event and also a book I have been reading, handily enough I recommend the book as a way into a fascinating subject. Here be the review. Don’t let the huge number of pages(848) put you off, this is a very readable and thoroughly researched account of the events leading upto the conquest and the inevitability of the action of conquest. But first to the beginning. Parts 1 and 2 of the book involve the backgrounds of the two civilizations. For the Mexica(Aztecs The Conquest of Mexico was a historical event and also a book I have been reading, handily enough I recommend the book as a way into a fascinating subject. Here be the review. Don’t let the huge number of pages(848) put you off, this is a very readable and thoroughly researched account of the events leading upto the conquest and the inevitability of the action of conquest. But first to the beginning. Parts 1 and 2 of the book involve the backgrounds of the two civilizations. For the Mexica(Aztecs) the focus is on the subjugation of and subsequent trade with other people in and around the valley of Mexico and also the domestic classes of people and the Gods which they worship. The religious set up is especially fascinating if you like your myths, as the stories mentioned in the book rival anything from ancient Greece or Mesopotamia. The Spanish chapter focuses more on the capture of the outlying island of the Caribbean, the brutality with which the indigenous populations were treated and the ruthless commercial opportunism that abounded, and the first explorations and meetings with the indigenous Peoples of the Yucatan and the Totanacs of Mexico. The next six parts of the book are a tragic essay on the ignorance, greed and violence that seems to perforate human society. The clash of cultures,the sheer naivety( don’t know how to do an ‘I’ with two dots over it) from both sides and the show of colonialism on a new continent show an age that has messages that still resonate today but have seemingly not be learnt. Of course hindsight helps to judge this. The first two parts were a bit of a challenge to get through but after that it’s an epic read, the sheer amount of facts that are included coupled with the high readability and extremely well researched subject matter make this an authoritative book that anyone with a passing interest(and a bit of time) would do well to read. Long, exhaustively detailed and written by a well-established Hispanist scholar, I picked this one up because I wanted a comprehensive yet approachable take on a subject I'm not overly familiar with. By and large the book delivers on that premise; it takes its time setting the scene by describing both the Aztec (or more appropriately, the Mexican) and Spanish societies prior to contact, with an emphasis on the settler societies in the West Indies in the case of the latter. It then tells the stor Long, exhaustively detailed and written by a well-established Hispanist scholar, I picked this one up because I wanted a comprehensive yet approachable take on a subject I'm not overly familiar with. By and large the book delivers on that premise; it takes its time setting the scene by describing both the Aztec (or more appropriately, the Mexican) and Spanish societies prior to contact, with an emphasis on the settler societies in the West Indies in the case of the latter. It then tells the story Cortes, Montezuma and the conquest in painstaking detail - this is the kind of book that introduces characters by starting with their parents - and the final campaign against Tenochtitlan is related on an almost day by day basis. ...This is an acclaimed history? I'm on my second attempt. If nothing else, I *do* need the sleep aid these days. Here's hoping either it gets better or I wake up more refreshed. I'd take either outcome. "These allies helped to guarantee a mutually advantageous lacustrine economy of fifty or so small, self-governing city states, many of them within sight of one another, none of them self-sufficient. Wood was available for fire (as for carved furniture, agricultural tools, canoes, weapons, and idols) from the slopes of the mountains; flint and obsidian could be obtained for some instruments from a zone in the north-east; there was clay for pottery and figurines (a flourishing art, with at least nine different wares) while, from the shore of the lake, came salt, and reeds for baskets" (5). This is as complete a telling of Spanish conquest of the Caribbean islands and Mexico as I have ever read, with a heavy emphasis on Cortes and those around him and a lesser emphasis on Montezuma, the Mexica, their allies, vassals and enemies. I will say, as a lay person, this actually may have been too much detail, as there were definitely times while reading where I felt bogged down minutiae. That said, if you are in fact interested in the subject, I highly recommend. Both Cortes and Montezuma a This is as complete a telling of Spanish conquest of the Caribbean islands and Mexico as I have ever read, with a heavy emphasis on Cortes and those around him and a lesser emphasis on Montezuma, the Mexica, their allies, vassals and enemies. I will say, as a lay person, this actually may have been too much detail, as there were definitely times while reading where I felt bogged down minutiae. Es un libro difícil de leer, con pasajes muy farragosos que me han hecho que más de una vez lo dejase de lado para volver a cogerlo más adelante. El autor interrumpe muchas veces la acción para ponerse a describir la procedencia de cuanto conquistador español aparece por las páginas, y muchas veces sustituye partes de la narración por cartas de estos, escritas en el español de la época. Cosas como estas, que deben ser apreciadas por los historiadores, rompen el ritmo y resultan muy pesadas para Es un libro difícil de leer, con pasajes muy farragosos que me han hecho que más de una vez lo dejase de lado para volver a cogerlo más adelante. El autor interrumpe muchas veces la acción para ponerse a describir la procedencia de cuanto conquistador español aparece por las páginas, y muchas veces sustituye partes de la narración por cartas de estos, escritas en el español de la época. Cosas como estas, que deben ser apreciadas por los historiadores, rompen el ritmo y resultan muy pesadas para los simples aficionados (que es a quien se supone que va también dirigido el libro). As an archaeologist and a history nerd, this is the best of both worlds. This book is meticulously researched and excellently scripted. Rather than take the predominantly fashionable position that the Spaniards were evil and the Aztecs were peaceful victims, Thomas lays out a much more complex and appealing story with layer upon layer of personal intrigue and political maneuvering. I have read this book twice and have found it to be engaging both times. The overall story is fascinating and tragic, but the narrative gets lost in too many details about too many minor characters and too many minor events. He also enjoys making references to obscure historical events. The writing style was also on the cumbersome side. I think this author sets the record for using the most commas per sentence. Wow. There was a lot more to this chapter of history than I had ever realized. All of the contextual information on both the Mexica and the Spanish led to a greater understanding of the opposing forces. The background on Cortes was especially enlightening. it's much clearer why he was so determined to conquer Tenochtitlan. At first consideration, the mere girth of this book is daunting. Opened, though, it is an amazing glance into a civilization snuffed out in its prime. It's got it all - - descriptions of the land, the Aztecs, the governing systems of the Mexica, battles, blood, gold and, of course, Cortez the conquerer. Recommended for history buffs with time to burn. Hugh Swynnerton Thomas, Baron Thomas of Swynnerton, was a British historian and Hispanist. Thomas was educated at Sherborne School in Dorset before taking a BA in 1953 at Queens' College, Cambridge. He also studied at the Sorbonne in Paris. His 1961 book The Spanish Civil War won the Somerset Maugham Award for Librarian’s note: There is more than one author in the Goodreads database with this name. Thomas was educated at Sherborne School in Dorset before taking a BA in 1953 at Queens' College, Cambridge. He also studied at the Sorbonne in Paris. His 1961 book The Spanish Civil War won the Somerset Maugham Award for 1962. A significantly revised and enlarged third edition was published in 1977. Cuba, or the Pursuit of Freedom (1971) is a book of over 1,500 pages tracing the history of Cuba from Spanish colonial rule until the Cuban Revolution. Thomas spent 10 years researching the contents of his book. Thomas was married to the former Vanessa Jebb, daughter of the first Acting United Nations Secretary-General Gladwyn Jebb. From 1966 to 1975 Thomas was Professor of History at the University of Reading. He was Director of the Centre for Policy Studies in London from 1979 to 1991, as an ally of Prime Minister Margaret Thatcher. He became a life peer as Baron Thomas of Swynnerton, of Notting Hill in Greater London in letters patent dated 16 June 1981. He has written pro-European political works, as well as histories. He is also the author of three novels. Thomas's The Slave Trade: The Story of the Atlantic Slave Trade, 1440-1870 "begins with the first Portuguese slaving expeditions, before Columbus's voyage to the New World, and ends with the last gasp of the slave trade, long since made illegal elsewhere, in Cuba and Brazil, twenty-five years after the American Emancipation Proclamation," according to the summary on the book jacket.